The Kingdom of Cambodia sits at the heart of Southeast Asia, a dynamic region of trade in the world economy. 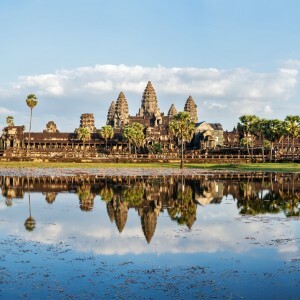 Cambodia’s 1999 membership to the Association of Southeast Asian Nations (ASEAN) and 2004 accession to the World Trade Organization (WTO) have opened the country up to the global marketplace. Cambodia is located in the heart of Southeast Asia. It is surrounded by Thailand to the west and northwest, Laos to the northeast, Vietnam to the east and southeast, and the Gulf of Thailand to the south. The country has easy access to seaports and airports, and is rich in natural resources. Cambodia is a member of various international and regional organizations that facilitate trade. Among these are the World Trade Organization (WTO), Association of Southeast Asian Nations (ASEAN) and ASEAN-China Free Trade Area (ACFTA), in which Cambodia enjoys duty-free privileges for exports and Most Favored Nation (MFN) treatment. For manufacturing businesses, Cambodia offers exemption from import and export duties and corporate income tax for up to 8 years. Cambodia maintains an open economy and encourages foreign investment. In fact, it is one of the most liberal economies in Southeast Asia. Tax incentives, a “one-stop service” for the swift process of investment applications, and the ability to develop within Special Economic Zones, all offer extra reasons to invest in Cambodia. Except for the ownership of land, the country does not discriminate against foreign nationals. Therefore investors can own 100% of their business. Additionally, Cambodia does not fix prices on products and services, allowing business owners greater control of company operations. Cambodian law also offers investors various tax and duty exemptions and employment allowances. With regards to tax exemptions, investors can enjoy a corporate tax exemption for up to eight years depending on the nature of the project. Additionally, there is a 100% exemption of export tax available for some investors. Cambodia also allows investors to employ foreign nationals if skilled workers, managers or experts are needed to conduct business. Special Economic Zones have recently been introduced to Cambodia. All industrial activities are brought together into one special development under the auspices of the Special Economic Zone. Each zone contains a production and service area and may also include a residential area to accommodate workers. The MOC and the CDC are the institutions responsible for overseeing foreign direct investment and business development in Cambodia. FDI projects which are eligible for business incentives are called Qualified Investment Projects (QIPs) and must be registered with the CDC. The Law on Investment (2001) awards investment incentives to QIPs unless they are detailed in the Negative List of Sub Decree No. 111. QIPs fall under four types of business plans. These are contracts, transfers, ownership, and state management. There are various schemes within these plans open to the investor which include, but are not limited to: Build, Operate & Transfer (BOT), Build, Lease & Transfer (BLT), Build, Own, Operate & Transfer (BOOT), and Build, Own & Operate (BOO). All companies that conduct commercial activities in Cambodia must be registered. The registration must be made by the company’s incorporator or director. A sole proprietorship is an enterprise which is established and operated by a single natural person who is the owner of all its capital. The obligations and liabilities incurred in the operation of the business are thus his/her sole and exclusive responsibility. A Private Limited Company is a contract between two or more entities who agree to conduct any commercial activity. Every Private Limited Company is subject to the commercial registration requirements, which must be done at the Ministry of Commerce. A PLC is managed by officers and directors and funded by capital provided by shareholders. It is the most common legal business form; however, forming one is more complicated and expensive than forming a sole proprietorship or partnership. Companies are constituted through a process that leads to the filing of Articles of Incorporation (AI) to the MOC. The control of a company lies with its board of directors; however, the Law of Commercial Enterprise (“LCE”) and the PLC’s constitution limit the precise nature of the control. The LCE also controls most aspects of how a PLC is formed, how business is conducted and how the company is dissolved. The company shall issue a minimum of one thousand shares with a par value of not less than KHR 4,000 per share. Therefore, the minimum share capital for setting up is KHR 4 million (approximately US $1,000). A company must have a registered office address in Kingdom of Cambodia. Profit tax is payable on profits generated in Cambodia. A Public Limited Company (PLC) is a form of limited company that is authorized under the law to issue securities to the public. Unlike private limited companies, it may have more than 30 shareholders. A Representative Office (RO) may be established by an eligible foreign investor to facilitate the sourcing of local goods and services and to collect information for its parent company. They also serve as a channel for promoting and marketing the home company’s products and services in the host country. An RO is regarded as a cost center and accordingly should derive no income from its activities and thus is not generally subject to Cambodian tax laws. However, the RO is subject to tax requirements with regard to the withholding tax on salaries paid to employees in Cambodia, a patent tax and an annual business operation tax. Ministry of Commerce. The words “Representative Office Agent” must be placed before or after the name of the principal enterprise. A Branch Office is an office that is opened by a company of another foreign country for the purpose of conducting a particular commercial activity in Cambodia. The Branch Office is the same entity as the parent company, and therefore has the same name as the parent company. It can conduct the same activities as the RO-Agent. In addition, it may purchase, sell or conduct regular professional services or other operations engaged in production or construction in the country. The branch and parent company have joint liability with respect to losses and debts of a branch office, and the Branch Office must also meet local taxation obligations. The Branch Office is also subject to the commercial registration requirement, which is handled by the Ministry of Commerce. Additionally, the word “Branch Office” must be placed before or after the name of the parent company.